THE UNIQUE “PRESENTATION” WATERLOO MEDAL. This amazing medal was clearly always intended to be a special “Presentation” piece and it was not made with a normal clip and ring suspension in mind. The uniquely officially impressed dating, personalized naming and fond sentiments to General Alava which continue around 100% of the medal’s edge and would have been obstructed by the top clip had it been suspended in the normal way. 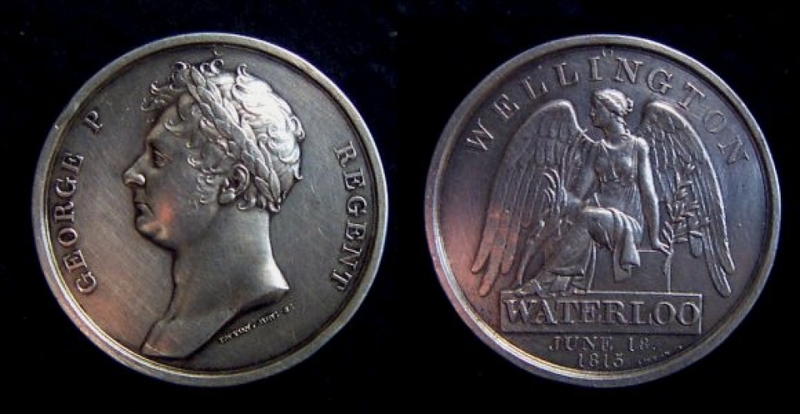 Edge punctuation is by use of the normal ‘star stops’ as used on a regular Waterloo Medal. LEADING TO THE PRESENTATION OF THE MEDAL. Frederick Robinson, Viscount Goderich resigned his post as British Prime Minister on 8th January 1828. On the morning of 8th January 1828 Wellington had the customary audience with King George IV, where, after the many previous requests from the King, he finally accepted the Prime-ministerial position. He officially gaining the office on 22nd January 1828. Wellington’s great friend General Don Miguel Ricardo de Alava accompanied him to the audience with The King. Having just arrived in England a few days earlier, as an exile from the personally dangerous current regime in Spain, General Alava was introduced to the King as a close friend of The Duke and as a greatly loyal ally of Great Britain who had served the British Crown with great distinction at The Battle of Waterloo. No previous or ‘normal’ award of the Waterloo Medal relating to General Alava’s service during the campaign is recorded and it is thought that during the Royal audience Wellington requested the permission of the King to have struck and impressed that very day at The Royal Mint a “SPECIAL” WATERLOO MEDAL for General Alava in recognition of his great personal friendship, loyalty and service to the Crown. Here we have that very medal which is officially impressed in the Royal Mint's standard and classic style.